I honestly can’t believe I have been able to go this long without writing a real post and I feel like after writing this one, I never will again. I figure while I cook up some dinner, I might as well take a much needed (and hopefully deserved) study break! I have so much to talk about so get ready for a long-ish post. The past week or so has been hectic as a prepare for a serious run of exams and catch up with homework but in between the mayhem, I made time for fun and adventures. 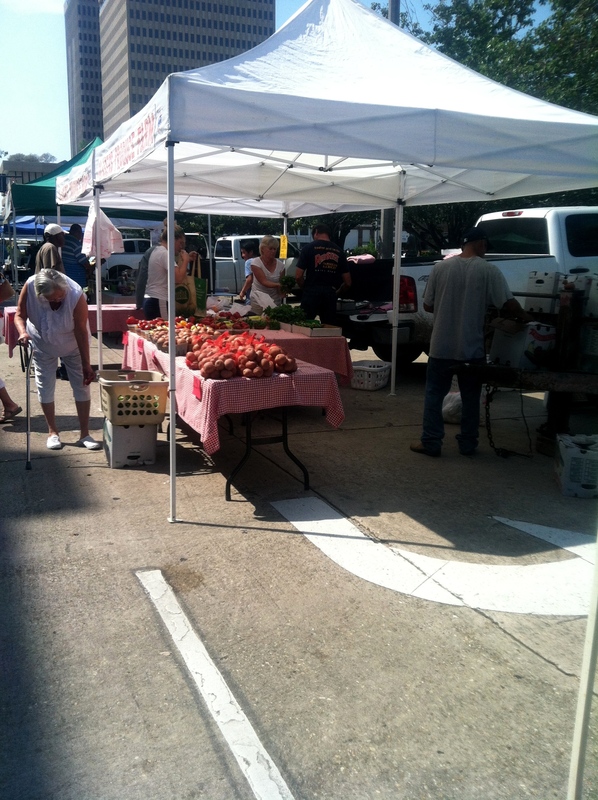 First stop for my adventurous weekend was to the Farmers Market that they have every weekend in downtown Baton Rouge. I had heard about it my freshman year when I was here at LSU but didn’t have a car so there was just no getting there. Then, in the month that I was here, I was so tired and worn down that I hardly ever went off campus but this year, it happened. A friend of mine had mentioned two weeks ago that he wanted to go and although we ended up missing it that weekend, we were both up early enough to make it this time. We drove to downtown which, being from outside Boston, is a huge difference. In Boston, it’s easy to lose your way because of all the tall buildings that leave you with few landmarks but in BR, there are only a few tall buildings and it’s a far cry from the hustle and bustle of Boston. Once we got to the market, we took a quick look over all the booths before going back and stopping at the ones that had caught our interest. Although there were a few that I wanted to stop at, I didn’t bring cash with me knowing that if I did, I would end up coming home with tons of items that I didn’t need. We stopped at a few of the cheese stands which my friend enjoyed and he picked up a few goat cheeses to try out which he said were amazing. There were also a ton of bread, meat and dessert places that were definitely calling my name. I’ve officially learned my lesson and next time will be bringing some money with my so that I won’t just have to torture myself by looking at all of the scrumptious items for sale. In addition to all of the food items, they also had some live music which was awesome. 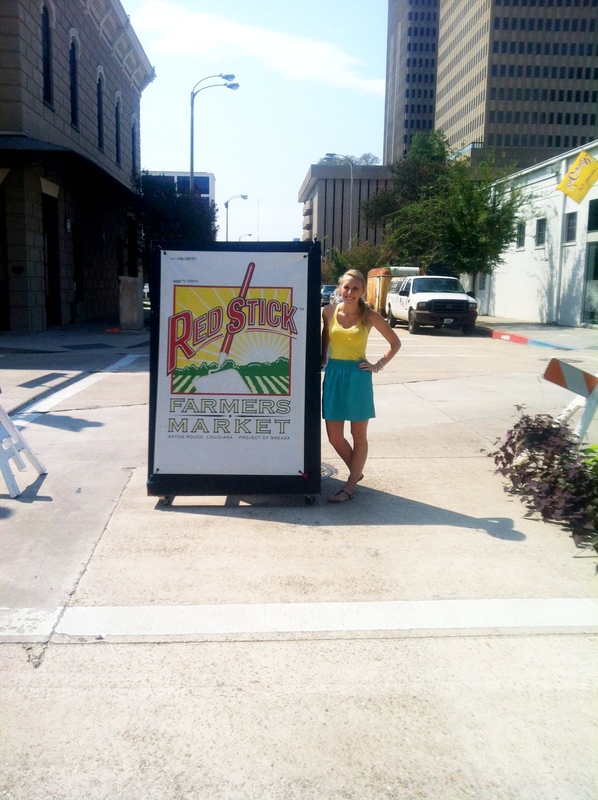 Basically, if you’re in the Baton Rouge area, you should definitely hit up the market! 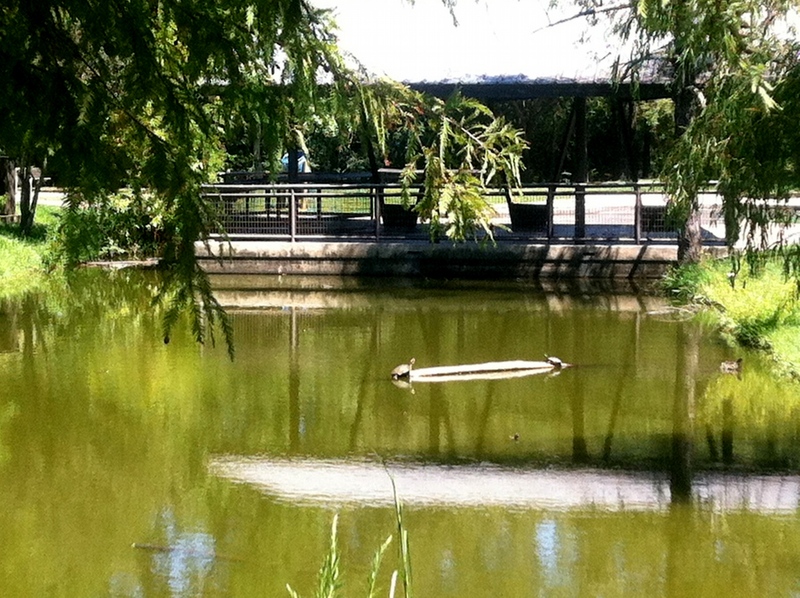 The next adventure was definitely one that I wasn’t expecting to find in Baton Rouge. The same friend that I went to the farmers market with sometimes goes running with my and I had mentioned how back home, I found a park with trails that I absolutely love to run at. I even got Chris to go there with me for a run! He then proceeded to ask me if I knew that Baton Rouge had a swamp in the middle of it which had trails all around that you could hike. I honestly had no idea being that the area of Baton Rouge where we live is largely structured around the college. Come Sunday morning, we are up and ready to head over to the Bluebonnet Swamp and hike a few trails. We arrived at the park and started off on our adventures which ended up being a ton of fun. The trails were a lot flatter than I am use to, being that Massachusetts has hills everywhere but it was very cool to find the wilderness in the middle of a city. Although we didn’t get to see any alligators, which I was VERY much hoping to see, we saw some other wildlife that was definitely new to me….and some of which proceeded to scare me half to death but I managed to make it through all of the trails without getting eaten by anything. You can see the pictures from that trip here. Unfortunately, I couldn’t get the slideshow to upload on here. Aside from those adventures, it has been a lot of school work. Because of Hurricane Isaac, a good majority of my tests got pushed back and now I have one every school day until next Wednesday although one is already out of the way. I had my Calc II exam this morning and I’m pretty sure I aced it seeing as how I though it would take me the entire hour and I was done relatively early. As always though, I stayed longer to check over anything and ended up using the whole hour anyways. I’m planning on spending the rest of tonight studying for my Oceanography test tomorrow and hopefully getting a goodnights sleep so that I will be ready to go when the actual test comes around tomorrow afternoon. Wish me luck! I hope you all have a great rest of the night and an amazing Friday! Get ready because it’s almost the weekend! P.S. Funny story. 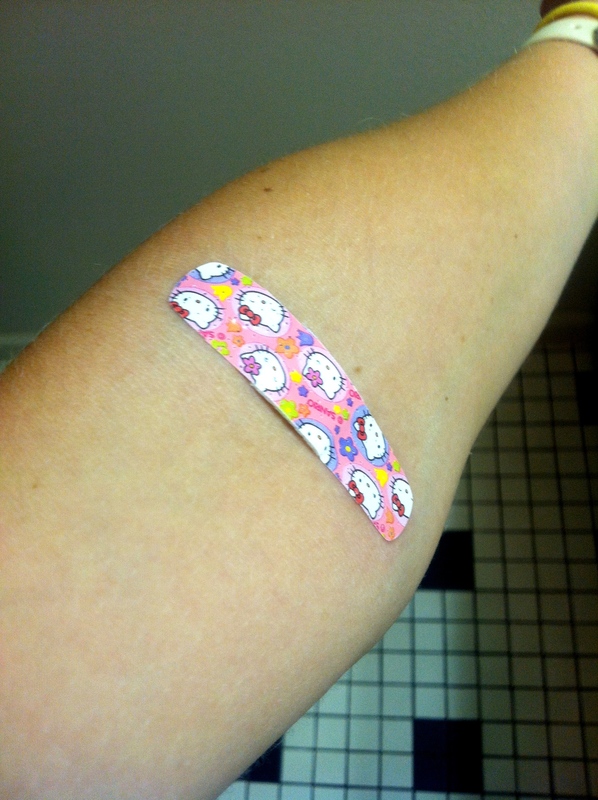 I had to have blood drawn today and although it didn’t go as smoothly as I had hoped, I survived. In fact, I went through the entire process without even shedding a tear which is a first for me. I have officially reached Big Girl status…..or so I thought. The bandaids that they gave me at the health center were really itchy and as I was driving to Walmart, I remember that I had some Hello Kitty ones in my car that I wasn’t allergic to so I replaced the shiny disco ball bandaids with the pretty pink ones. Long story short, as I was standing in line at Walmart, the woman noticed that I had the Hello Kitty bandaids on and said it was strange that they gave a grown up those bandaids. At that point, and awkwardly, I might add, I had to admit that I had in fact bought the bandaids myself at which point she laughed hysterically. If nothing else, I made at least one person smile today and that is more than enough for me!